One of the top 3-sport athletes to come out of New Hampshire in the past few years has made his college decision, as Curtis Arsenault (Berlin, NH) has committed to Plymouth State University where he will play both basketball and baseball. Arsenault was an all-state player at Berlin High in basketball, baseball and soccer. He played all 3 sports this past year as a post-grad at Phillips Exeter Academy, and he was recruited by colleges in all 3 sports. Arsenault was kind enough to do an exclusive interview for the NH Notebook, proving an in depth breakdown of how the recruiting process went for him and what lead to his commitment to Plymouth St.
"Going to PEA helped me get a lot more interest from coaches in all 3 sports" said Arsenault, who scored 1,000 points, won a state title and D-III Player of the Year in basketball while at Berlin High. "I had 6 schools recruiting me for basketball, 2 for baseball and 2 for soccer. Endicott, Emmanuel, Clark, Lyndon State, Wheaton, and PSU showed plenty of interest for basketball. Endicott and PSU were the only schools that reached out to me about playing baseball and basketball. Clark and Wheaton reached out about me playing soccer and basketball." Plymouth St. came on strong late to bring in a terrific local recruit. "It was an interesting process for me" Arsenault explained. "Basically the whole year I had my mind made up about going to Endicott to play basketball and baseball. I just loved the school and really felt comfortable with coach Rowe. Clark and Emmanuel also interested me a little bit. PSU was a dark horse. I never really thought much about going there even though I had some talks with Coach Clay the assistant baseball coach at the beginning of the year. Coach Novak came into the picture for basketball a little later and didn’t make a push that early. As he found out that Endicott and the other schools weren’t giving me great packages he started to come on much stronger and I developed a better relationship with him. This really got me thinking seriously about PSU for the first time." It is clear that Arsenault took everything into consideration when making this decision. "Last month I narrowed it down to Endicott, Clark, or PSU" said Arsenault. "When I got the package from PSU and talked to my family I decided that it’s the cheapest, closest to home, and I got comfort level of playing baseball under coach Clay before so everything just seemed to make sense so I decided Plymouth was the right place for me. I just think its funny because a month and a half ago I never would have envisioned myself at Plymouth but the place just started to grow on me more and more each day and now that’s my home for the next 4 years and I am excited about it." Due to time requirements, it is rare that you see multi-sport athletes at the college level. However, Arsenault plans on beating the odds and playing both basketball and baseball at Plymouth St.
"I am excited for the challenge of playing two sports in college" said Arsenault. "I think that the challenge of balancing academics and athletics at this wonderful school at PEA has prepared me to take on the challenge of playing 2 sports in college. I will only be pitching at Plymouth during baseball season so it won’t be as big of a commitment as someone playing basketball and being a skill player on the baseball field." Arsenault benefitted greatly from his PG year at Exeter. "I am so thankful for getting the opportunity to spend a year on this great campus of PEA" Arsenault continued. "It was an incredible struggle to handle the work the first term but I was able to make the adjustments and battle through it. I think academically I am much more prepared to succeed in the college classroom then I was before this place. The academics here are just unreal. Everybody here wants to learn and hold each other in high expectations. Athletically it was also a step up from d3 NH sports. I would say the sport that this was most obvious was basketball. The height and talent change was huge and took a big adjustment. I battled through it and went from playing rarely at the beginning of the year to starting at the end of the year. For this to happen I had to buy into defense and turn myself into the best defender I could be. I just wanted to play so I had no problem changing into a defensive player that brings a lot of energy. I’d say before PEA I was not ready to step in and be an impact college player right off. Going through this extra year I fully believe that I will be an impact player at the next level for both sports right off. I really enjoyed my time here. The most challenging thing here was just making the adjustments and always trying to bring something different to the table every day in the classroom and on the floor or fields." 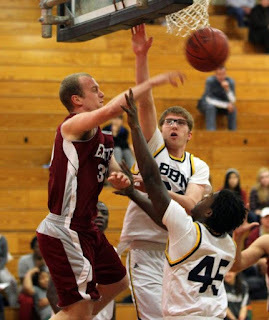 Arsenault was a key member of a Phillips Exeter boys basketball team that won the NEPSAC Class A championship. "This past year of basketball was amazing" said the 6-foot-2 Arsenault. "At Berlin I was the go to guy so I had to save my energy and fouls and pick my spots. This made it so I could not be going all out all the time. Being around so many guys with so much talent this year it gave me the opportunity to play as hard as I can every time I was in the game. I did not have to worry about running out of energy because the next guy in the rotation would step up and get the job done. It was also nice not having to worry about foul trouble which led to me playing much more aggressive on defense. It was just an amazing year of basketball. Everyone on the team is super talented at basketball but it was more impressive to see how good everyone’s work ethic was. There are a lot of talented teams that under achieve but because we had a group of great guys we all clicked and became a family. I don’t know if I will ever experience the closeness off this team anywhere else. It was truly a family of brothers looking out for each other and having fun on the basketball court." Arsenault has been a winner on every team he has played for, and he plans on continuing that success at Plymouth State. "I have been talking with Logan Kesty and we are determined with the help of the other guys around us to turn this basketball program around" Arsenault concluded. "I have never been on a losing team and I don’t plan on that changing for either sport next year. I really like that Plymouth is close to home which will give me the opportunity to follow my two younger brothers basketball careers. (Levi and Evan). I can’t wait until Levi is a Senior and Evan is a Freshman and getting to watch them play together. Being at Plymouth will give me the opportunity to watch a few of those games. I also really look forward to teaming up with coach Novak and Coach Clay and getting after it at the next level." Congratulations to Curtis on all of his success thus far, and best of luck to him in the future.